Inox is a new and all-encompassing solution offering 4 different variations in one turn-key package. The Stylish Inox stainless steel hydrotherapy pool is a new and revolutionary concept in pool building materials. Inox pools are bespoke and manufactured to your detailed specification. 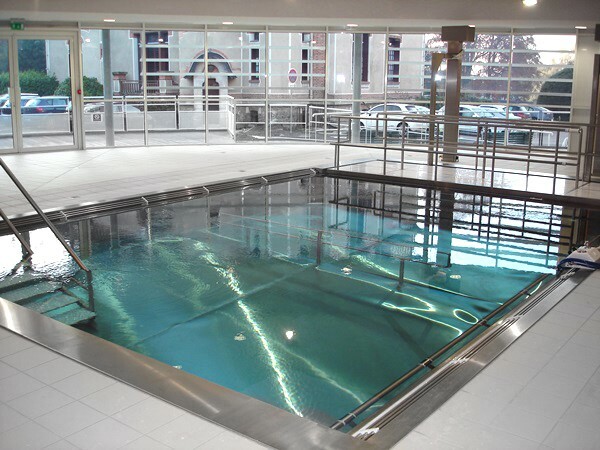 Reval manufacture pool designs that can be sunk into the ground or installed above the surface offering a truly flexible solution, to optimise your building or room space. The finish achieved is stylish and visually modern. 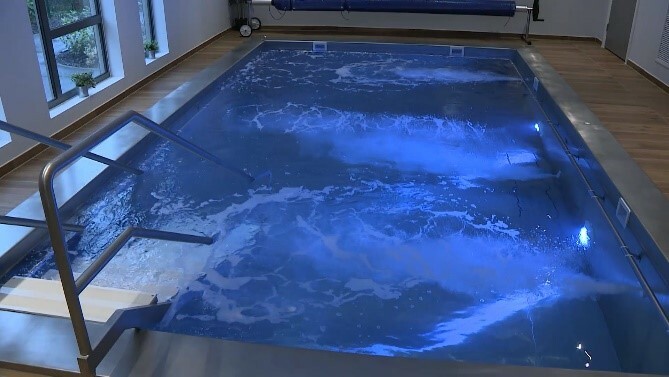 Reval offer many different in-pool options and accessories including in-pool mood-lighting for colour therapy and relaxation or hydro-massage jets designed to rehabilitate pool users by developing and maintaining muscle tone and mobility. We also offer a range of aqua training equipment such as aqua-cycles, in-pool seats or stretch out bars for arm and leg rehabilitation. The stainless material of construction has a heat retaining property designed to help maintain pool temperatures naturally which helps to reduce electrical consumption over time. The stainless steel finish is hygienic and low maintenance to help reduce cleaning down time. Reval provide a truly turn-key design and manufacture solution to ensure a trouble free project seamless transition through to completion. A modular multi-piece on the ground fabrication complete with plant works and installation that can be built and installed within a room or property retrospectively. This concept is a fantastic solution when upgrading or refurbishing your facility. This method is very unobtrusive as the building blocks of the pool can be simply carried into the pool area, assembled and sealed forming the shape and design of your pool. There is also the option to integrate a poolside hoist to assist with pool side transfers for those who are unable to use the pool steps. Plant room equipment is designed and installed along with your pool as a truly turn-key product. Our stainless-steel pool liner system is designed as a stainless-steel re-lining solution to upgrade or extend the life span of an existing concrete pool. As part of our turn key solution, Reval will also design and install upgraded plant equipment if required. This is a very cost-effective way of refurbishing your existing pool and plant works with the minimum complexity and cost. Our pool liner concept will help future proof your investment meaning you can enjoy many more profitable years of use from your pool into the future. The Reval Poolside hoist is the perfect solution for transferring those with reduced mobility in and out of your therapy pool. The pool hoist is available with detachable seat and stretcher systems which provide access for all levels of dependency promoting inclusion and well-being for all. The hoist is available with manual or powered rotation to meet your preference or budget. This cleverly designed therapy lance consists of a control panel designed to sit on the lip of your hydrotherapy pool or to be mounted on a stainless-steel support stand. An aid for helping to build muscle tone and improve circulation this hand held massage lance with varying pressure adjustment allows specific muscle groups to be focused on more effectively. 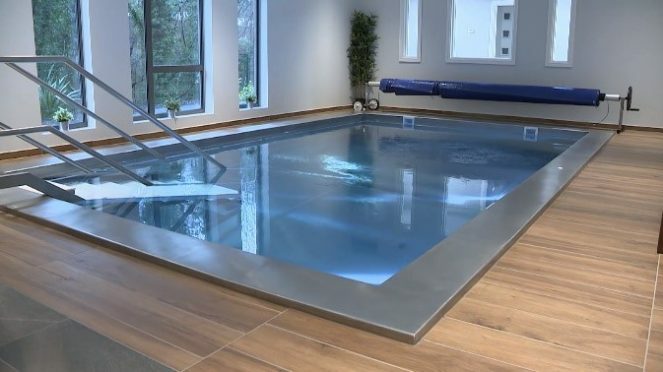 To further aid rehabilitation and well-being Reval offer a range of in pool exercise equipment for your hydrotherapy pool. These include stainless steel therapy bars, a submergible in pool massage table and submergible aqua cycles and pool seats. 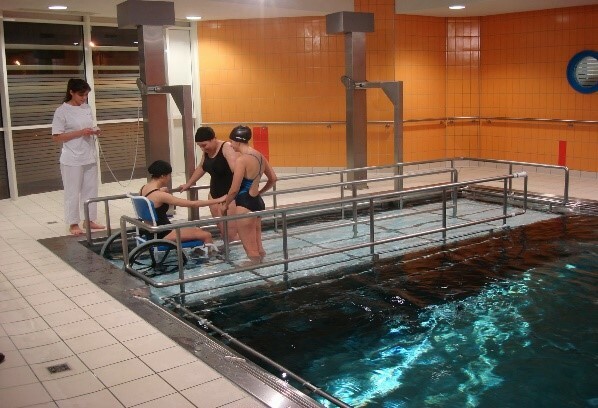 Available in double or single walkway options the Level Access Platform which can be adapted perfectly to suit the dimensions of your hydrotherapy pool is the perfect addition for facilitating user access. The mobile platform makes it possible to adjust the level of immersion according to the therapeutic regimes, the anti-slip floor ensures maximum safety, rise and descent is smooth thanks to the pneumatic remote control. The walking corridor allows the patient and the carer to make the most of the preventive and curative functions of the pool by easing the effects of gravity, reducing load on muscles and bones for safer more effective rehabilitation.